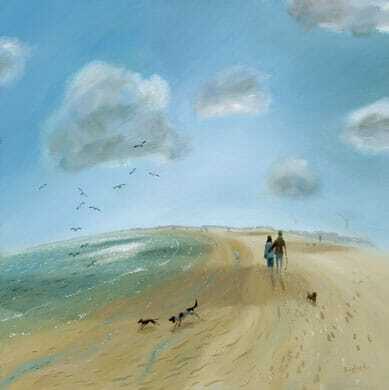 British landscape paintings and original prints made by contemporary UK landscape artist, Lynne Roebuck. My fine art prints and paintings are original and unique to me, made using oils or lino. From left to right&colon; Two plein air oil paintings. 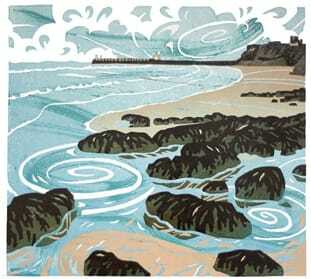 The two large ones are studio landscape oil paintings followed by two acrylic paintings and last – but not least – two linocut original prints. What kind of art do I make? 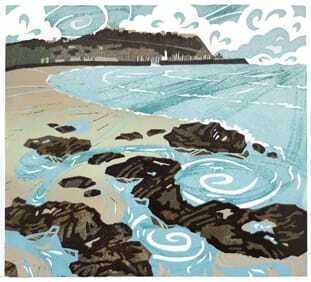 I primarily paint landscape oil paintings and print limited edition linocut original prints. 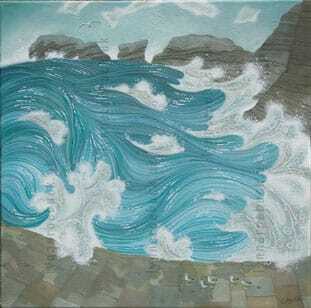 All my art, so far, is of the British countryside, seaside/coastline and its surrounding seas. My collection of original, unique art, currently includes Northumberland, Yorkshire, and The South Hams in Devon. I work in my studio from reference and outside in front of the scene. 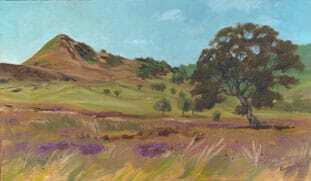 My plein air paintings often form part of the reference for my studio paintings and prints. I'm always adding to my gallery of contemporary landscape paintings and prints, covering the North of England and the much painted Southern Counties. Why do I make this kind of art? Growing up in the countryside has shaped who I am today. So from the single blade of grass and the magical, mysterious thing we call a cloud, to the epic and breathtaking vista, it all still fascinates this kid. Since visiting Devon, Northumberland, Cumbria, Lancashire, Pembrokeshire in Wales and Inverness in Scotland to name a few, I can safely say Yorkshire, where I'm based, is not alone in its distinctiveness and diversity of scenery. The variety is in fact a characteristic of the UK terrain from the tip of Scotland to the foot of Cornwall. It's not surprising that the British landscape has been represented by artists in paint and other media for more than 250 years. Naturally, Yorkshire subjects dominate my collection at this time, though I'm always hopeful of being able to paint further afield. I already have many sketches, of 'foreign' parts elsewhere in the UK, waiting for me to work-up into finished art. Detail of an oil painting completed in my studio – Wigginton Road in Summer. I'm in count-down mode (sounds better than panic mode doesn't it) to my exhibition at Burton Agnes Hall in May. There's so much to sort-out when you're taking-on a self organized show. There's always far more to do than just paint paintings and get them framed. It's at the 'Feels Overwhelming' stage right now, though I'm just getting my head down and plodding through my 'to do' lists – which so far has always worked for me before. A couple of days painting outdoors on the beach at Bridlington and sketching at Flamborough Head, despite a bitingly cold wind taking away any warmth in the sunshine, resulted in some work which will be available at my exhibition. I'd hoped to get a few more days there, but I'm not sure this will happen before my exhibition now. Having completed almost all the art I'd planned for my Courtyard Gallery show at Burton Agnes, I'm already beginning to think about the other subjects I want to paint this year. In January I mapped-out an artwork production schedule which is pinned to my studio noticeboard. It hasn't gone completely to plan, but I expected this as I'd been ambitious. I'm due to have a week up at Bamburgh, painting incessantly I hope (weather permitting), after Burton Agnes is complete. I have some time in between where I'll give myself a little time off. When you're self-employed, it's all too easy to forget you're not super human and need some R&R (rest and relaxation) from time to time. If you don't manage the urge to be continuously productive all the time, a lack of time off can take a toll as I found at the end of last year. So I'm determined to chill for a short while, with just a little bit of relaxing plein-air work in Harrogate, or York… or both, for fun. I explain my approach to making landscape art here. Detail of an oil painting completed in my studio – Whitby Harbour. The best place to buy my contemporary British landscape art prints and paintings, if you're in Yorkshire, UK, where I'm based is from my galleries. You'll be able to view my landscape art there and, in the case of my lino prints, choose between framed and unframed options. You'll also be able to ask questions and get advise about buying, framing, displaying and protecting original linocuts and paintings – and you won't pay extra for this extra service. They are welcoming, knowledgable, helpful people, who won't pressurize you to buy, so do visit them if you're in the area. I'm currently working to make it possible to buy my landscape art from this website. I was hoping to achieve it last year (2018), though other work took priority. Looking to pin my art? Check out my art Pinterest account.